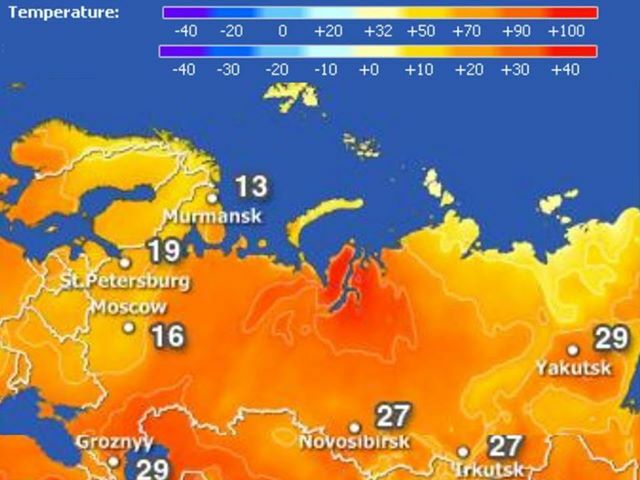 Above image, from Wunderground.com, shows high temperatures close to the Kara Sea, where methane readings over 1950 have been recorded for some time now (see earlier posts here and here). 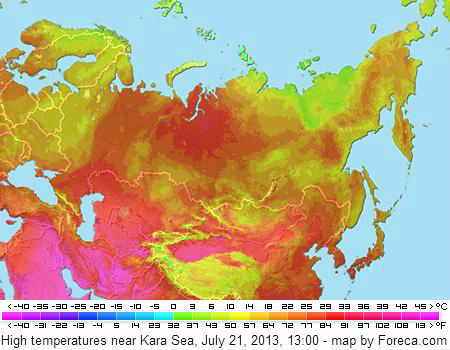 The image below, from Foreca and kindly provided by Albert Kallio, shows that temperatures on parts of Kara Sea and surrounding coast hit 40 degrees Celsius (or 100°F) on July 20, 2013. The image below, also from Foreca, shows the situation on July 21, 2013, at 1:00 pm. The NOAA image below shows sea surface temperature anomalies for July 18, 2013. The animation below shows methane readings for July 19, 2013. High readings over the Kara Sea persist, not surprisingly, while there's a worrying spot of methane over the East Siberian Sea and there are a number of high readings showing up over Greenland. The animation below is a 3.1 MB file, so it may take some time for it to fully load. Above animation shows the location of the sea ice versus the depth of the seabed. As discussed in previous posts (here and here), there are areas close to the North Pole where the sea ice has been very thin for some time. The above animation shows one spot just north of Greenland with a high methane reading. The spot shows up at a location where the sea ice is typically at its thickest. 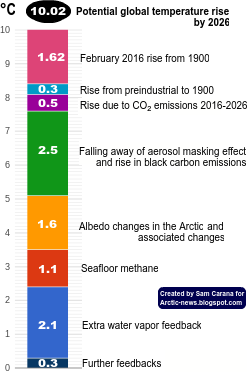 At first glance, it may seem hard for methane to rise from the seabed and escape into the atmosphere through such a thick layer of sea ice. 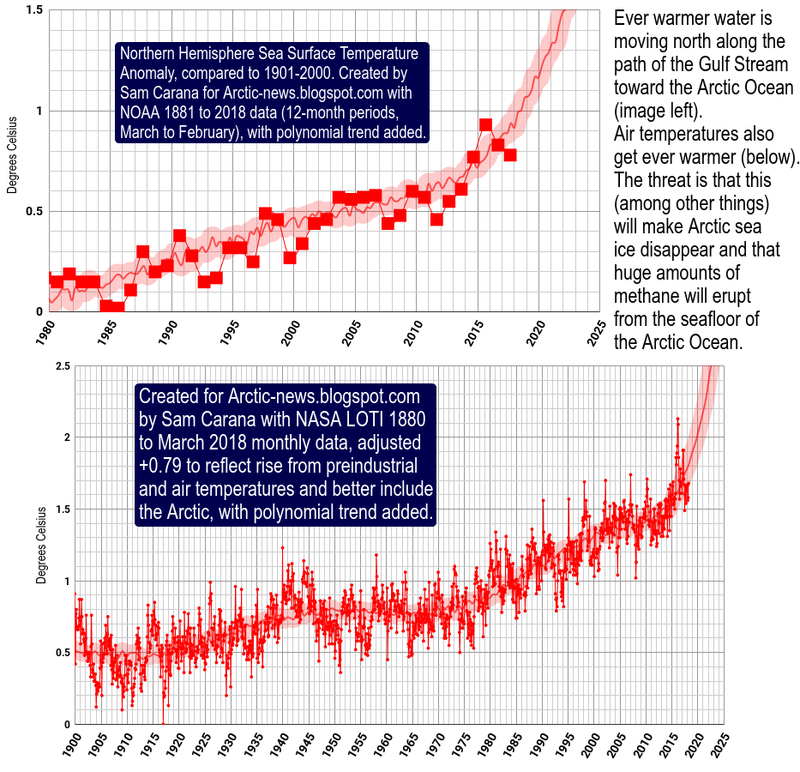 But take a look at the animation below, from the Naval Research Laboratory, showing sea ice thickness over the past 30 days. Indeed, there has been quite a bit of movement in the ice in that area, making it easy for methane to enter the atmosphere there.